Nano Life Science Institute (WPI-NanoLSI) of Kanazawa University, Japan aims for acquiring a fundamental understanding of the various life phenomena, such as development, disease and aging through transdisciplinary research of Nanometrology, Life Science, Supramolecular Chemistry and Computational Science. 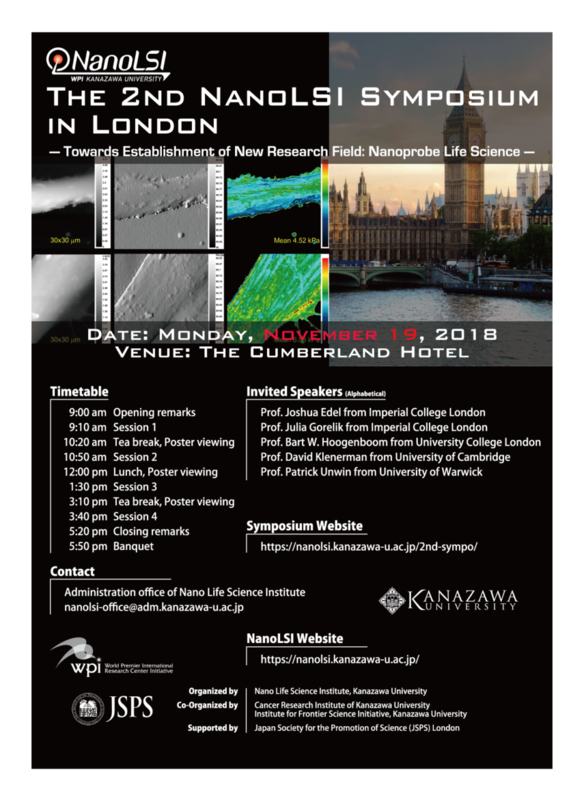 Following the first international symposium held in Tokyo in February 2018, NanoLSI holds the 2nd Symposium in London to enhance collaborative relationship with Imperial College London as well as to initiate collaborations with researchers around the UK. We are sincerely looking forward to seeing you at this symposium. *Registration is required in order to attend the Symposium via our Registration Form. ■Fee：Free of charge to attend the symposium, but GBP 40 is required to attend the banquet. All participants are kindly requested to make their own travel, accommodation, visa, and related arrangements.